62 I-CONNECT007 I SHOW & TELL MAGAZINE 2018 factory. This CFX demonstration was just that. 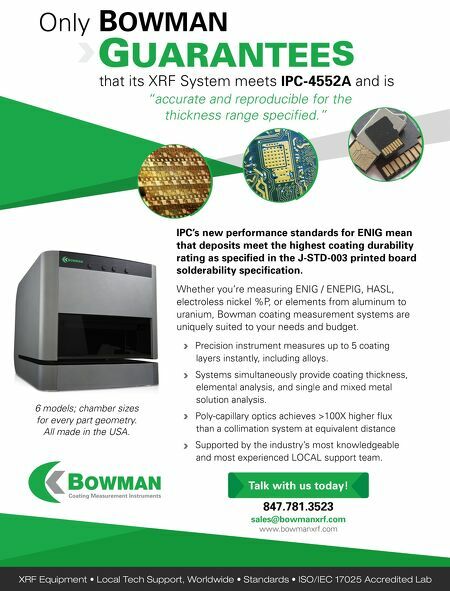 Imagine having these vendors integrated together towards one common manufacturing goal; this is a true industry evolution. IPC Introduces Innovation Awards Early during show, IPC announced the win- ners of the IPC APEX EXPO 2018 Innovation Awards, which recognize "outstanding prod- ucts and services in the electronics industry." Thirty-four products and services were sub- mitted by 32 exhibiting companies for evaluation by a panel of experts who provided a numerical value based on what makes the product inno- vative, how the product changes the manufac- turing industry, and what value customers will experience with the new product. The IPC APEX EXPO Best of Innovation Awards were presented during the Wednesday morning keynote to the following companies: • DfR Solutions—for their temperature-based FEA with Sherlock Automated Design Analysis Software, the first-of-its-kind automated design analysis software tool for analyzing, grading, and certifying the expected reliability of prod- ucts at the circuit card assembly level • JBC Tools—for JBC Net, a pioneering soft- ware system that manages and optimizes the hand soldering process, standardizes param- eters, and controls operator performance • Metcal—for their Connection Validation Robotic Soldering System that addresses the needs for reducing risk and increasing produc- tivity • Orbotech—for Ultra Dimension, an auto- mated optical inspection series for advanced PCB manufacturing processes—the first AOI solution to integrate four solutions into a sin- gle system: pattern inspection, laser via inspec- tion, remote multi-image verification, and 2D metrology IPC President and CEO John Mitchell summed up this new award category by say- ing, "The IPC APEX EXPO Innovation Awards allow us to celebrate the innovators and for- ward thinkers who are changing the techno- logical landscape of the electronics industry. The product and service submissions were certainly innovative, and the companies did an exceptional job in identifying their products' unique value in the industry. The innovative submissions directly indicate the strength of the electronics industry and its ability to respond to new challenges resulting from emerging technologies." S&T Best Technical Paper Taking top honors, the best technical conference paper of IPC APEX EXPO 2018 was, "Equivalent Capaci- tance Approach to Obtain Effective Roughness Dielectric Parameters for Copper Foils" by Marina Y. Koledintseva, Oracle. Her co-author was Tracey Vincent, CST of America. 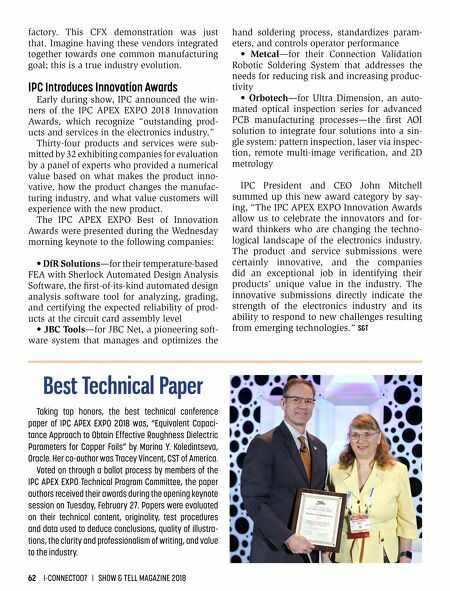 Voted on through a ballot process by members of the IPC APEX EXPO Technical Program Committee, the paper authors received their awards during the opening keynote session on Tuesday, February 27. Papers were evaluated on their technical content, originality, test procedures and data used to deduce conclusions, quality of illustra- tions, the clarity and professionalism of writing, and value to the industry.